When a run-down home in De Tonti Square practically fell into his lap, Bobby Isakson jumped headfirst into a top-to-bottom renovation. According to a well-worn proverb, “Necessity is the mother of invention.” That might well be the case, but Bobby Isakson would probably argue that boredom is the father of it. After all, it was being “bored on the weekends” that inspired the 29-year-old Mobilian to turn a dilapidated property in the De Tonti Square Historic District into a pet project. And although boredom was the inspiration, the finished product is far from unimaginative. Standing outside the 1895-built home on State Street, it’s hard to believe it is the same “derelict” place Isakson first laid eyes on in late 2016. It was in that year that the Lafayette Land Company, for which Bobby serves as vice president under the leadership of his father Robert J. Isakson Sr., purchased the property in a package deal that included the old Waterfront Rescue Mission building next door. The company has an impressive track record in commercial and retail development, which includes the Cheese Cottage and Nova Espresso. Its main focus with this parcel was outfitting the Waterfront Rescue Mission building into the Iron Hand brewpub. But Bobby was nagged by another idea. But there was nothing “little” about the undertaking. Although he describes himself as “pretty handy,” Bobby admits that he had zero experience taking on something of this magnitude. His secret? The study in Isakson’s house faces the street and welcomes lots of natural light. The renovating newbie attacked the remake on weekends, tackling the initial demolition with a worker before rebuilding many of the interior walls and windows. Although he subcontracted things like painting, sanding, sheetrock installation and fine carpentry, Bobby handled an impressive amount of the workload himself, such as the task of leveling the house, which had sunk over time. He also replaced roughly 30 percent of the outdoor siding panels, added insulation (of which there was “not one lick”), renovated and relocated many of the windows, and moved around several interior walls. One of the greatest successes was the revitalization of the hardwood flooring. “After I removed the carpet, the tile and the black mastic, the floor still had a black residue that looked like it had seeped into the wood. I was terribly afraid that sanding it would take us down too close to the tongue.” He forged ahead nonetheless, and with four workers sanding nonstop for a week, elegant wood floors arose from the dead. 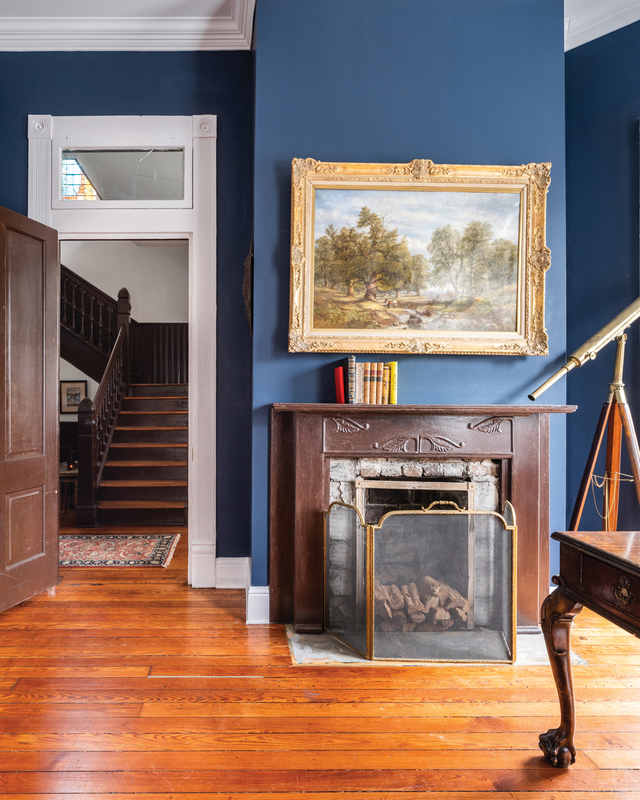 Like the rehabilitated flooring, the home itself is coated in layers of history. The property was a single-family residence for several generations before being donated to the Waterfront Rescue Mission. Mobile’s homeless would attend a church service and eat a meal at the main property next door, then the men would trudge upstairs to their beds, while the women came here (now Bobby’s house) for a night of rest. A downstairs bathroom, hidden by a built-in bookcase, is one of Isakson’s favorite features. As with every renovation, there were surprises along the way. Bobby’s favorite discovery was a small stained-glass window covered with a piece of plywood. 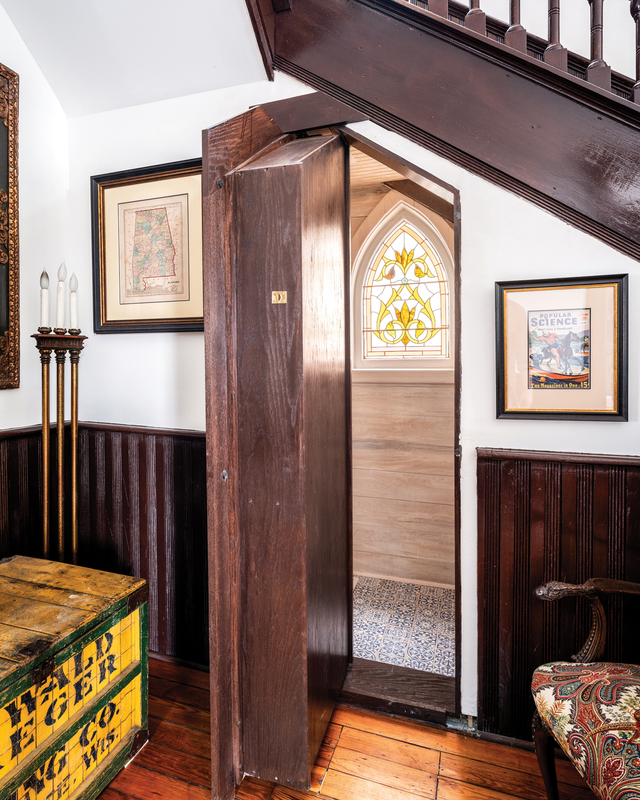 That little gem would inspire the home’s most dramatic flourish, a 250-pound, 10-by-5 foot stained-glass window that once adorned a church in New Orleans. With the help of two workers, Bobby improvised a pulley system hung from an exposed attic beam, and hoisted the window into its place above the staircase. Ironically, Bobby’s second favorite feature of the house is located underneath the same staircase, where a built-in bookcase swings out to reveal a secret bathroom. “It’s fun to tell people the bathroom is under the stairs, then watch them walk around confused,” Bobby’s girlfriend Ryann jokes. Because of its prior use as a homeless shelter, Bobby inherited a home with an unusual layout, but it allowed him more freedom to execute his vision. “There was no kitchen, there were no bedrooms; it was just lots of rooms,” he says. But that lack of structure inspired his creativity and opened up endless possibilities, such as the addition of a breakfast nook and mudroom over what was once the back porch. 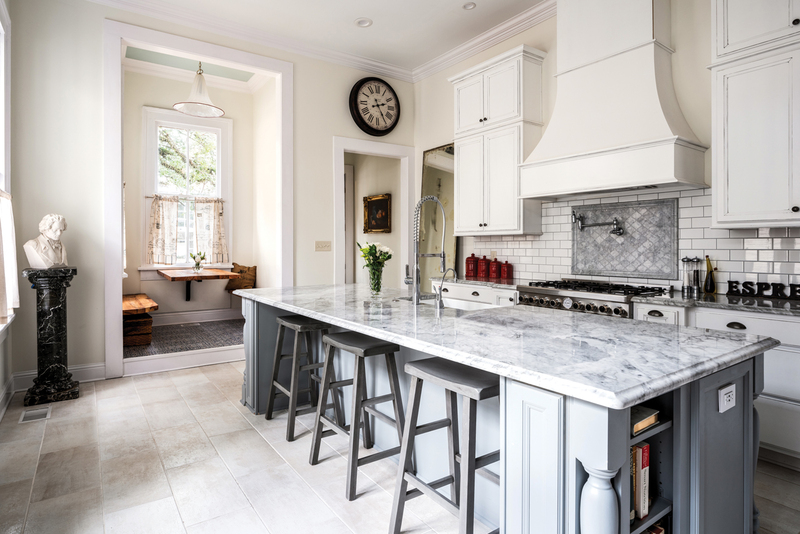 The kitchen, which had been four bathroom stalls and four showers, is now a sleek space, complete with the same white Italian marble countertops found in the upstairs master bath. Installing the modern tub, weighing in at 480 pounds, required a little more of Bobby’s ingenuity. “When I finally started putting in heavy stuff, like appliances, I decided to invest in a winch,” he says. The yellow gadget, attached to a beam on the upper back porch, is testament to Bobby’s resourcefulness. “I ended up having to combine a few winch systems together,” he says. As for the home’s decor, Bobby used furniture and art salvaged from industrial spaces to temper the daintiness of his period antiques, giving a masculine edge. He has an impressive assortment of gilt-framed oil paintings scattered throughout that lend the space a distinguished air. The paint colors, finishes and furnishings are neutral and take a back seat to the unique architectural elements. Now, after finally moving into his new home at the end of 2018, Bobby stands beneath the industrial winch on the upstairs back porch, pondering whether he was ever overwhelmed by the “little” renovation project. “There were times when I woke up in the middle of the night, came over to the house and started working at, like, 2:30 in the morning,” he says, explaining that he felt a constant itch to move things along. 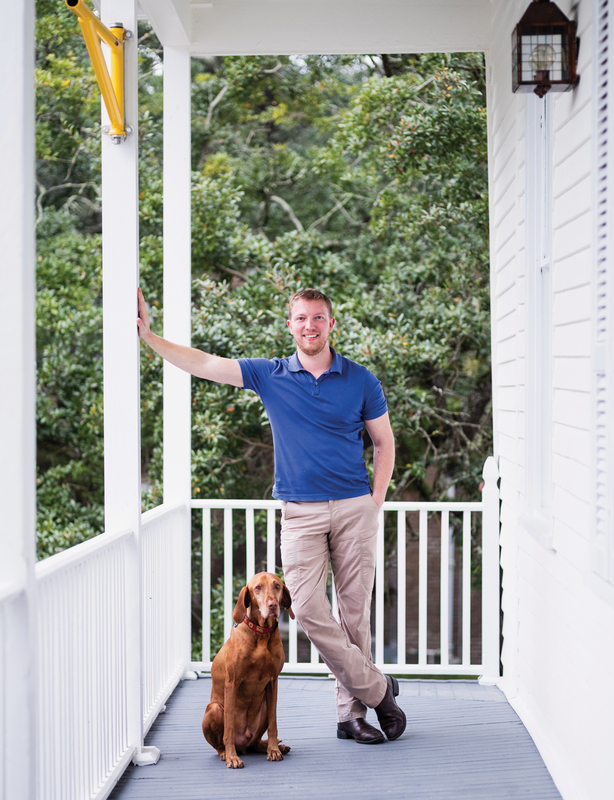 Based on how much he learned over the course of those 18 months, Bobby also obtained his General Contractors License, a nice side benefit that has come in handy in his role at Lafayette Land Company. And, of course, he got his dream house.